We all like to read and enjoy small short stories in free time, irrespective of our education level and our age. The short story entertains us and teaches us the lesson as well. We should take out some time and read out the stories to refresh our mind. There are numbers of people spending time reading the stories, and it helps in improving thinking capacity. Here we have come up with another interesting and incredible short story about a holy snake and how greed can be dangerous for us. I hope you will enjoy reading my story. Long ago, there named an old man Vassu; a poor farmer lived in a very small village with his family. He was very kind, generous and hard working person. Though he used to work very much harder but still was not able to earn much to fulfill his family needs. Sushobhan, his son, used to ask for the money every time. He was very lazy and greedy person. “Be happy and fully satisfied with what you are having, don’t be so greedy,” Vassu used to say his son every time. On Saturday afternoon after finishing of the field work, Vassu was resting under the shade of a big banyan tree. There suddenly he noticed a black snake sitting on the nearby mount. On seeing the farmer Vassu, the snake coiled itself and sat upraising the hood. “It looks very calm and peaceful,” “might be it is hungry” Vassu though. Immediately he rushed towards the house and brought a bowl filled up with milk and offered it to drink to the snake to feed the hunger. The next day on Sunday morning when he came to take the bowl he saw a golden coin into it. He though that “I am sure that this snake is a holy snake.” After that, daily Vassu used to feed the snake and leave the bowl nearby the snake. Daily he gets the gold coin into the bowl. It made the poor Vassu a rich man. Let’s see what happens next in this story. Once, he went to another village to attend the marriage of his friend’s daughter. His son Sushobhan was given the responsibility of feeding the snake daily. As usual daily, he started getting the gold coin in the bowl. In greed of more gold coins, he thought that “I am sure that there is a treasure of gold coins hidden somewhere beneath the mount where snake used to live.” “If I kill it, the whole treasure will be of mine.” Having the greed of gold in his mind, he tried to kill the snake but didn’t get succeed. 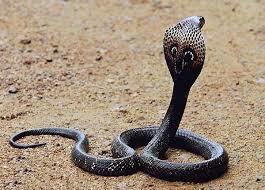 Because of anger the snake bit Sushobhan and anyhow the snake escaped from there. When Vassu returned back to home, his wife explained him everything. “I always have tried to warn you against the greed,” “now see how dangerous it can be.” Then Vassu rushed towards that snake, and with the folded hand he asked snake to forgive and offered the bowl of milk. But this time, that holy snake didn’t accept it and said Vassu “I spared the life of your son just because of the kindness of yours,” “You have to suffer harder for It.”, the snake got disappeared. So see how the greed can be dangerous for us. I hope you have learned a lot and might surly have enjoyed reading my story. Soon I will be back with more interesting stories.